Metro CERT Director Diana McKeown with the Great Plains Institute took a moment to interview Ellen Anderson, Executive Director of the University of Minnesota’s Energy Transition Lab, about an important new project to help communities reach and measure progress toward their energy and emissions goals. What does LoGoPEP stand for, and what is the goal of the project? Ellen Anderson: Local Government Project for Energy Planning (LoGoPEP). The project builds upon existing efforts to engage local governments in committing to actionable strategies for energy and greenhouse gas emission reductions. LoGoPEP will provide communities with planning tools and actual results to measure progress toward their goals. This project is being developed at the Twin Cities metropolitan regional scale with the goal of future replicability and institutionalization throughout the state. When will there be information that can be shared with other cities so they can incorporate those ideas and thinking into their comprehensive plans? We also just hosted a webinar all about the project that offers a great introduction for communities that want to learn more. The webinar, “Tools for Local Government Energy Champions,” can be watched here, or you can download the slides here. What is the current status of the project and pilots? What are you learning so far that was surprising? Ellen Anderson: One, that implementation really happens at the local level. Two, that to reach a consensus on setting aspirational goals can take time, but it’s just as important to have a detailed plan for how to achieve goals and measure results. 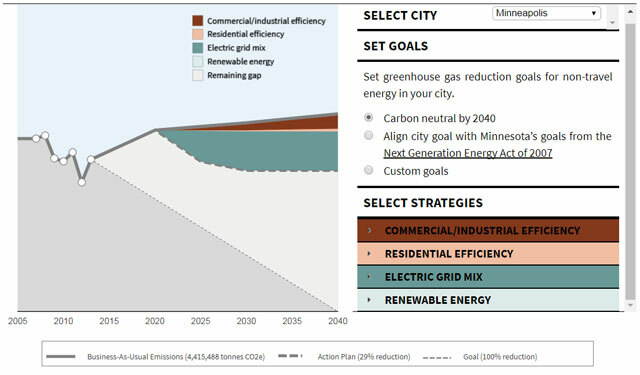 For example, if a city wants to meet the state’s Next Generation Energy Act goals and reduce greenhouse gas emissions 30% by 2025 and 80% by 2050, a lot of choices and tradeoffs have to be made to be successful. Often city operations can yield great results, but then scaling it up to the whole community is another challenge. The good news is that there are lots of other cities around the region and the world that have experiences we can learn from, and this will be part of our toolbox for cities. I’ve been so impressed by the high ambitions of cities around Minnesota and the nation, where hundreds of mayors have stepped up to say they will lead the way to reduce carbon emissions. How can cities learn more and get involved? Ellen Anderson: Visit the LoGoPEP website at https://www.regionalindicatorsmn.com/energy-planning to access the tools and learn how to get involved. Thank you!